Going to Mars is still in NASA's plans for 2038. One of the main issues being investigated is how exactly it is possible to get a crew to the red planet back home after an extended stay. To ship anything to Mars, it will take 225kg of fuel to carry a single kilogram of payload. Carrying enough rocket fuel for the return trip would result in a ridiculously large rocket. Instead of strapping huge fuel tanks full of volatile substance to a manned transport vehicle, a team of NASA scientists and engineers looking into synthesizing fuel on Mars. Not only is the Swamp Works team at the Kennedy Space Center looking to make fuel, there is also a plan to generate oxygen and water. The surface of Mars is full of silicon and oxygen-rich structures that are bonded to metal elements. 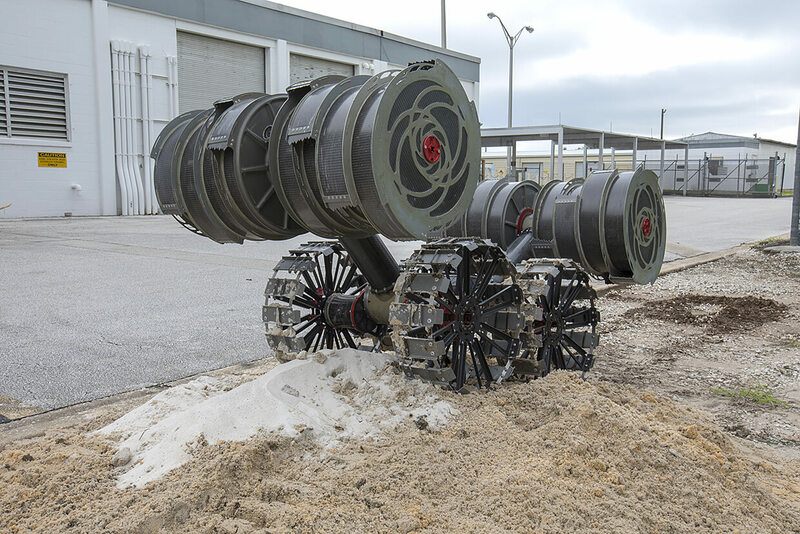 A prototype robot has been built to dig into the surface of Mars so that usable materials can be extracted. Since weight is critical, the Regolith Advanced Surface Systems Operations Robot, or simply RASSOR, has been engineered for minimum weight. Bucket drums on opposing sides that rotate in opposite directions allow for forces to cancel out and prevent the robot from tipping during excavation. 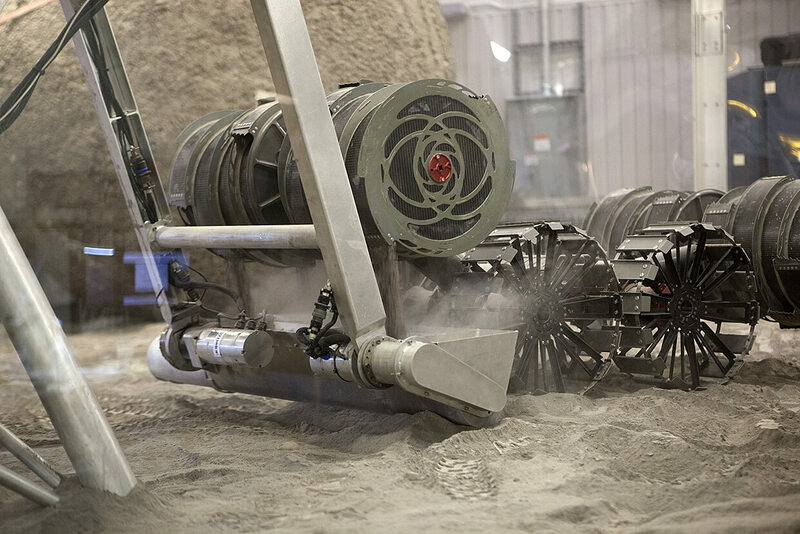 A shallow trench is created as the robot slowly drives along a path while the collected dirt fills up the drums. Once the drums are full, RASSOR will drive over to a designated processing area and reverse its drums to dump out its collected material. At the processing stage, an oven will heat the dirt and then collect water via a condensation tube. After going through several filters and deionizing stations, the result is drinkable water. However, drinking water is only one use. Splitting the water molecules into hydrogen and oxygen components allows for the two to be liquefied and compressed. As key components to liquid rocket fuel, there is plenty of evidence to support the idea that Mars' red dirt can supply enough ingredients to get a crew back home. There are still many challenges to overcome before the entire system is ready for deployment, but there will be plenty of advantageous advancements made over the next two decades. Why don't they just put all their effort in to overcoming the single biggest problem about going to Mars, I.e, current propulsion methods are not up to the job, too slow and too inefficient. Solve that, and all the other problems go away. Reehahs and cliffordcooley like this. It tells me that whoever is "planning" it, hopes not to be around by then. NASA is looking into future propulsion methods, for instance - Ion Thrusters - https://www.nasa.gov/centers/glenn/about/fs21grc.html Even so, pouring money into research does not necessarily guarantee success. However, my bet is that they are looking into creating fuel on Mars (or in whatever other scenario it would be appropriate) because the advanced research is not presently deemed feasible in the target date time frame. By 2038, things could change obviously. This, to me anyway, is a much brighter outcome than that guy who keeps babbling about sending a crew to Mars without any hope of return. Why just dont land dual fuel and solar panel that gives enough energy to get off Mars again. and use magnets like batman fly by. The Mars mission to be filmed in a desert near you. What exactly on Mars is there to be used for producing rocket fuel? I doubt very seriously there are fossil fuels available for refining. Not fossil fuel, just water. As the article said they will mine for water then split the H2o into Hydrogen and Oxygen, then compress the gasses for storage. It will be interesting to see where this goes, from a scientific aspect. My guess is that even if it does prove real, it will be years in development and not ready in time for the proposed date. I have seen other articles on it. The most recent article on it is as a result of German research. But follow-up analysis "clearly indicates that the 'thrust' is not coming from the EmDrive but from some electromagnetic interaction,"